Black finish with 78.75" bar stock track and standard door hanger and wheel. Includes all mounting hardware for stud wall and concrete wall installation. Barn Door Window Shutters: Functional. Unique. Attractive. Let’s assume that you want to add some unique and delightful design elements to your home and you’re thinking about window coverings. Forget about old fashioned drapes, they’re so passé. Ignore the inclination to go to Venetian blinds that get dusty and are a nuisance to clean. But you want privacy and are open to a dramatic and attractive trend setting solution. Why not consider the remarkable visual effect you’ll create by installing barn door window shutters in your living room, dining room or den. With mini barn doors and one of our attractive mini barn door hardware kits you can revolutionize the appearance of a room in no time at all. And when you’ve decided that’s the decorating route you want to go head for the Trending Home Décor website at www.trendinghome.com where you’ll find a full range of possibilities to use as window barn doors. We’re the same people who brought you the beautiful sliding pantry door that revolutionized kitchens across the GTA and beyond. Our website illustrations are for full size barn doors but you’ll be able to order barn door style shutters in the exact size you need for your specific windows. Think about this solution to window coverings. Barn door window coverings are attractive, easy to install, low maintenance and provide an effective sound barrier for outside noise. 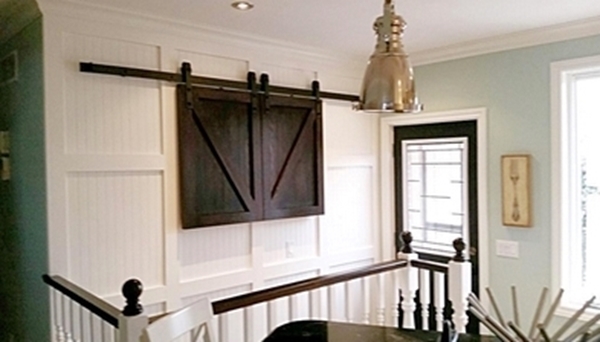 When you use barn doors with windows along with our classic mini barn door hardware kits you’ll be a leader in this new trend in interior design. It was when our pantry sliding barn doors became popular as an interior design feature that we looked for other ways to use this approach to a unique style of home decoration. Why not link our wide range of barn doors and mini barn door track and hardware with windows that are best covered for privacy, noise reduction or to add a dramatic flair to your home? You hang one of our window barn doors and people will notice! A quick trip to www.trendinghome.com and you’ll see we offer a style and finish in these unique window coverings to enhance and match any tone or style you’ve selected for your office, home or cottage. For example, look at our classy yet traditional Shaker style acacia wood barn doors or window coverings that can be made in several finishes to match your decorating needs. Link this window covering with our mini barn door window hardware and you’ve got a complete set to provide a striking feature in any room. Perhaps you want something more rustic. Then maybe our Canadian classic pine window covering is what you need. Select this model and you’ll have a distinctive and stylish addition to your home or cottage. All of the sliding pantry door style window coverings we offer at Trending Home Décor hug the wall and take up very little physical or visual space. Work with us and we’ll find just the right finish to complete the total effect that you wish to create in your home. Flexibility in design is our goal and we offer window coverings with different width and finishes in the pine or acacia wood you select. As well, we offer several choices in the barn door window hardware you select to compliment your room design. For track on which to run your new window coverings you can decide to use either the striking stainless steel or the less formal black steel hardware. Both are durable and easy to install and will give you many years of reliable service. While there’s a range of handles and locks available for our pantry sliding barn doors some of them might tend to be a bit large for your barn door with shutters for smaller windows. Why not consider the ‘Stannis’ or ‘Trunk’ handles you’ll find on our website. They’re more discreet in size and design and perhaps more suitable for barn door window hardware. We have several ways for you to order your new dramatic window coverings. Dave, our barn door tech support specialist is always available on our Chat Line. He’s our go-to guy when you have questions about your order or how to solve a specific problem. He’ll pop up when you access our website. You can also drop us a line by email when you want to order your window coverings. Try info@trendinghome.ca and we’ll get back to you before you know it with a confirmation of your order or an answer to your questions. You can also reach us by phone at 1.647.457.6011. So, decide what you want, and then get in touch with us and we’ll have your order underway in no time at all. We can offer a surprisingly quick turnaround time to create and deliver your new window covering. Our many customers are pleased by the inexpensive and on-time delivery reputation we have established in the marketplace. We’re a proud Canadian company owned and operated by your fellow Canadians. We use Canadian sourced materials when that’s possible to create our attractive and reliable décor objects for your home.